Lately, I’ve noticed across Social Media a resurgence of what I would call “Emotionalism” ― the view that Reason and Rationality are unduly confining intellectually and prevent the attainment of metaphysical understanding, as well as artistic, ethical, and social insight. For example, I recently read a well-expressed piece whose thesis was that rationality seriously limits creativity. The dialectical tension between “Reason” and “Emotion”, between “Rationality” and “Faith”, and between “Logic” and “Intuition” has been pursued and argued for literally centuries. So, I don’t harbor any illusion that I can personally resolve the conflict in a few short paragraphs here. Or, for that matter, that the issue will ever be resolved completely. For surely, everyone is entitled to his or her opinion, when it comes such issues. Nevertheless, I suggest to you that most, if not all of the contemporary claims concerning the supposed inferiority of Reason to Emotion are based on a fundamental misunderstanding of what comprises Rationality and Reason, as well as a wrong-headedness concerning the nature of “intuition” and “intuitive judgment”. Reason seeks to understand and to guide action by considering evidence ― including that of perception and the senses ― by weighing data and theories against known or accepted facts, and by considering “logical” premises, assumptions, connections, implications and supported conclusions. However, this just barely scratches the surface. For logic itself is not limited to formal syllogistic reasoning, nor to only the two-value propositional calculus (the binary basis of computer languages to date). Rather, logic encompasses both formal and informal modes of reasoning, including some such as induction and eduction, which involve significant input from the sphere of intuition and intuitive judgment. 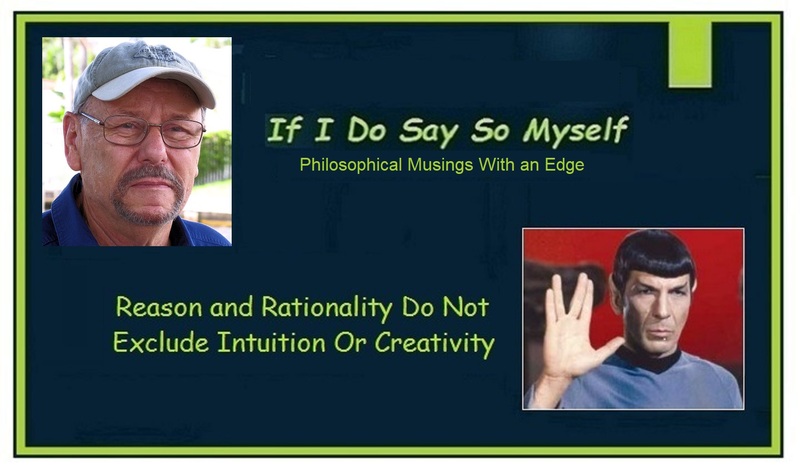 Intuition is not, I submit, a variant of Vulcan-style mind-meld with an underlying and unifying Universal force or spirit. Indeed, “intuition” is neither irrational, nor even non-rational, but is akin to the “background processing” that computers do ― namely, the assimilation and analysis of data and information, both intellectual and perceptual, away from the interference of the “conscious” mind. The difference between Reason and Faith was, perhaps, best delineated by the early 19th-century philosopher Søren Kierkegaard who spoke of the “Leap of Faith” that must be taken in the matter of the existence of God. Kierkegaard recognized that no amount of rational discussion or analysis would get one to the point of accepting that particular belief. But Faith comes into play in respect of things other the belief in God. Faith manifests itself in all manner of beliefs and tenets we embrace in our daily lives, all evidence and common sense to their contrary. Faith involves believing, for instance, that the course of one’s life is completely in one’s own hands. That if you just stay optimistic, you will attain all that you seek in life. That whatever doesn’t kill you makes you stronger and more able to deal with that which the future brings. Faith is reassuring, which is likely why some people find it so attractive ― although I suspect that first-person instantiations of Faith also trigger the release of oxytocin, serotonin, and endorphins into a True Believer’s bloodstream. I have no problem distinguishing between Reason and Faith… However, I reiterate that I reject the claim Reason and Rationality are necessarily separate and distinct from Intuition and Creativity. However, even assuming Einstein actually wrote or said that, it nevertheless does not follow it means what Emotionalists take it to mean. Einstein did not reject Rationality but instead saw that some instances of formal logic did not capture the full range and power of human Reason, and therefore, needed at times to be abandoned in favor of more free-ranging and creative species of thought. However, the key term here is “thought”. Some Emotionalists want to tell us that we have many more senses available to us than the commonly accepted five human senses of sight, touch, smell, hearing, and taste If only we throw off the limiting bounds of Rationality. Indeed, Emotionalists often want to take literally the expression “go with your gut”. Such claims are, again, a distortion driven by a priori assumption or, in the alternative, an underlying agenda. Does this mean that the Inuit have a special “snow sense”? Hardly. Because of the demands of their lives, they have refined their powers of perception to be able to recognize, among other things, snow they can walk on, snow they can use to build shelter, and snow that they may fall through and possibly be engulfed in. In order to refine their senses to that level, do they have to abandon Reason and Rationality? Again, not in the least. They have only to open their minds to the possibilities of attending closely to complex perceptions built by the same senses we all have and which we use every waking minute of every day and sometimes even whilst we sleep. I’ve met people who claim to be “Empaths”, those who experience directly the emotions and sensory stimuli that others feel. Yet, as a long-experienced sailor, I can pick out the precise direction from which the wind is blowing at any given point in time. I can pretty accurately and consistently predict wind shifts. And I can “sense” bad weather approaching from many miles and hours away. Have I attained ability by abandoning Reason and Rationality? No. It is a skill developed over many years of storing and background-processing the information of my senses. The feel of the wind on the back of my ears and in my hair (what is left of it, anyway). My continuous perception of subtly changing movements of the sea, as well as the directions and rhythms of wavelets at the sea’s surface. Ad not to be overlooked, the waxing and waning of pain in my arthritic left shoulder (injured playing ball in high school). Could I block or interfere with those necessarily heightened perceptions by focusing upon and “overthinking” the process of discerning them? To be sure. Could I fail to attain the skill involved by insisting on analyzing those perceptions consciously and deliberately, rather than giving my mind free reign to process and learn in the “background”? Most certainly. But, does opening my mind and body, my brain and greater nervous system, to all the available data mean that I am abandoning Rationality in favor of Emotionality? Not on your life! My ability to read the wind, predict wind shifts and anticipate bad weather can be seen, I believe, to be Intuitive. For it is the result of learning to process a huge amount of data outside the admittedly limited confines of conscious thought. But operating outside the confines of conscious thought is not, I submit, the same as being outside the limits of Reason and Rationality, properly understood. And it is pure poppycock to assert that Rationality stifles Creativity. Some of the most creative people I’ve known have also been mathematicians, scientists, and engineers ― thinkers fully steeped in systematic Reasoning. The difference is that such creative thinkers have the ability to allow their minds to range free, so that they may discern the forest for the trees. This is a discussion that could be continued ad infinitum. However, let it suffice at this point simply to reiterate that what is frequently mistaken for an opposition between Reason and Intuition, between Rationality and Creativity, is actually the dichotomy between the way of Reason and the way of Faith. I personally prefer the way of Reason, and I recommend it to you, because even a modest level of understanding brings with it a greater sense of peace. You are, of course, free to choose as you please. You can, if you wish, work instead to shut out Reason and Rationality. Just understand that, if you do so choose, you also abandon all hope of insight in favor of simply feeling. Which will not necessarily bring peace to your life. And finally, don’t try to tell me that, in order to be Intuitive or Creative, I have to forsake the bedrocks of Reason and Rationality. For surely if we give in to that, we will also eventually revert from speech to grunts and, I fear, cease to continue walking upright. I am a professional writer, editor, and speaker, with more than 1,000 published articles in print and digital media. I've also spent nearly three decades in the marine industry — as a yacht designer, boat builder, marine operations and business manager, marine industry consultant, marine marketing and communications specialist, yachting magazine journalist, yacht surveyor, marine industry educator and trained interest-based mediator and negotiator.